Form's "Team" fight shorts combine lightness and comfort. The material is a soft and pliable stretch fabric that won't fold under the high intensity of MMA training. 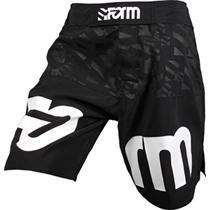 Featuring white logos on the front and back thigh, these loose-fitting MMA shorts are mostly black... A slick look from Form Athletics, the brand that sponsored so many top fighters in the WEC days. Email your friend about the Black "Team" MMA Fight Shorts. Ask a question about the Black "Team" MMA Fight Shorts.